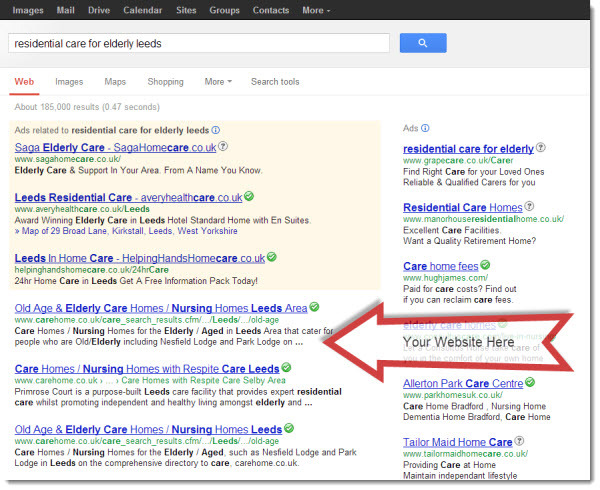 Being At The Top Of The Google Search Results Brings You New Clients! Your Potential Clients Are Searching Online…. Are You There? For your web site to bring you new leads, enquiries and sales it must be found on the internet by people searching for your product or service. The process of ensuring it gets found is called Search Engine Optimisation or SEO. SEO enables search engines like Google, Yahoo & Bing to understand what your web site is about and therefore to decide how relevant it is to a search someone is making. The better the SEO the more likely your site will be placed high in the results for that search. The higher you are in the search results the more sales and enquiries you will get. Search Engine Optimisation (SEO) is made up of ‘on page’ and ‘off page’ factors. On page factors are part of your web site itself and deal with the structure of the site and making sure it has the correct content. Off page factors are how other web sites view your site. Very broadly, the more people that like your site and link to it from their own site, the better the search engines assume it must be and the higher they place it in the search results. We have listed below our SEO package options that will help your web site to quickly climb up the search engine rankings for your industry searches, bringing you more leads, enquiries and sales. The on page factors are essential and must be done first. The level of off page work needed depends on the competition in your industry and how quickly you want to see results. This package is suitable for those in low competition cities and small geographically targeted sales areas and where budgets are tight.